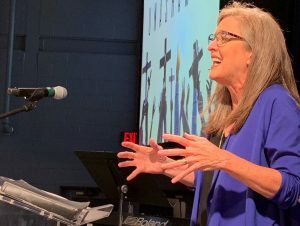 Grounding her message in Paul’s declaration to Timothy – “You have not been given a spirit of fear, but of power, love, and self-discipline.” (2 Timothy 1:7), Carolyn challenged the delegates to access the power, love and self-discipline which is the gospel. Referring to God’s call to Abraham to sacrifice his son Isaac, Carolyn called for an Abrahamic faith. “Faith is a decision to believe when it doesn’t make sense, accompanied by a love so fierce that nothing can compromise it,” she declared. You can learn more about the legislation enacted by the Global Legislative Assembly here. The complete text of Carolyn’s message may be accessed here.